Urad dal poori or bedmi poori is a popular Indian street food especially in Agra, Mathura, old Delhi and now an integral part of most Indian kitchens must say. Bedmi poori is served hot with spicy, tangy potato gravy with a pickle in North India and a popular breakfast item. 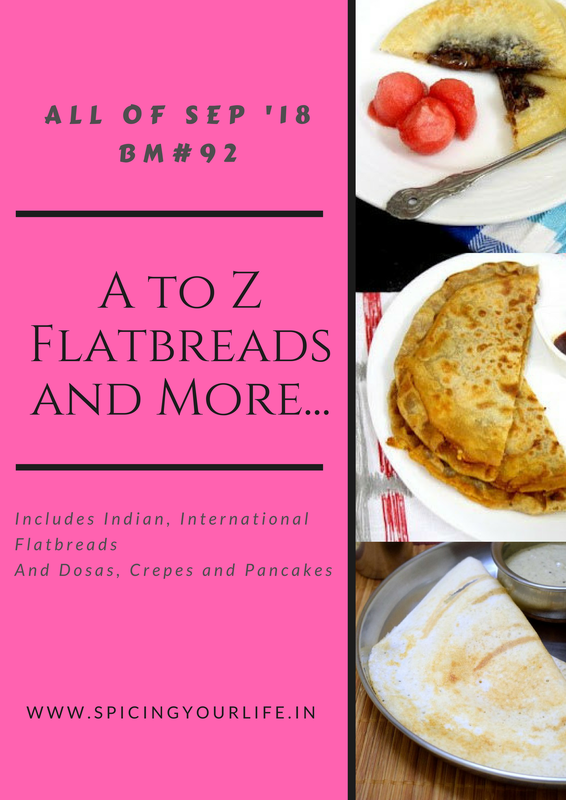 It is a deep fried whole wheat flour flatbread mixed with a spicy mixture of urad dal (lentil). This traditional breakfast Bedmi poori is also known bedmi aloo, bedmi kachori, urad dal kachori, bedvi, bedami or bedmi puri aloo sabzi. This is my first recipe as “no onion no garlic” recipe which is also vegan. Must say it is a filling, calorie-rich recipe but totally worth having on festive occasions. We are making this urad dal poori once a month. This puri is made in two ways. One is preparing the dry urad dal filling separately and then stuff in the dough, roll it thicker and smaller followed by deep frying. Smaller and thicker version of poori known as kachori. Another version has kneaded the dough with the grounded urad dal with spices. I have adapted the recipe from Nisha Madhulika. To make this puri first soak urad dal for good 3-4 hours. After that drain all the water and grind along with ginger and green chili to a coarse paste. Combine it with flour and other spices, use 3-4 tbsp water and make a soft dough. Now roll small circles and deep fry them until golden and crispy enough. Let see how to make bedmi aloo sabji or rad dal poori. First of all, clean, wash and soak urad dal for 3-4 hours. After 4 hours drain all the water and transfer it to a grinding jar with green chili and ginger. Make a coarse paste. Do not add water, since dal is soaked so it has enough moisture. In a mixing bowl add the coarse paste of urad dal along with the rest of the ingredients flour, semolina, and spices. Combine them well. Do not add water initially, first bind with the urad dal paste. You may need 3-4 tbsp of water to make a soft dough. Grease the dough with little oil on the top and cover it. Keep it aside for 15 minutes covering it. While the dough is on rest heat a kadhai with enough oil to deep fry. After 15 minutes divide the dough into equal parts. Roll each portion into 3-4″ circle. Once the oil is hot enough, slide the rolled circles in kadhai carefully. They puff up nicely after a few seconds flip on another side. Cook till golden color. Transfer it on the paper towel to absorb the oil. Repeat the same with rest of the rolled circle. Bedmi poori or Urad dal poori is ready to serve with tangy spicy potato gravy. First of all boil potatoes in a pressure cooker. Let the pressure releases on it own. Peel them and crush them using your hand. Make tomato puree and keep it ready. Now heat a kadhai on medium flame. Once hot enough add cumin seed, dry red chili, coriander seed and fennel seed. Let them crackle. Add chopped green chilies and cook for 10-20 seconds. To this add tomato puree. Cook this until it starts leaving oil on the sides. It takes 6-7 minutes, once puree is cooked add red chili powder, turmeric powder, dry mango powder and salt. Mix well. Finally, add crushed potato and water. simmer it for 5-7 minutes. Add chopped green corinader and cook further for 5 more minutes. By now gravy will thicken. Bedmi aloo sabji is ready to serve. While grinding soaked lentil does not add water. It has enough moisture. If required add 3-4 tbsp of water and then grind. Bedmi poori tastes great when served hot. They are crispy. We tasted these puris first time during our visit to Taj Mahal. They were so tasty in spite of being spicy. Since then I keep making, rather nowadays street food is a kind of party food for me where we invite friends at home. Urad dal poori or bedmi poori is a popular Indian street food.It is a deep fried whole wheat flour flatbread mixed with a spicy mixture of urad dal. These puffed up Bedmi poori can make anyone hungry. This is our favorite Sunday breakfast. Your aloo sabji is making it even more tempting. Thanks Ritu, bedmi poori with aloo sabji is such a killing combination. I have never made urad dal poori before and I am tempted to make some soon after seeing all your porri recipes. Healthy and good use of lentils in poori. Thanks Sandhya for liking this bedmi poori recipe. Adding the urad dal paste to the flour is a great way to have a mess free pooris..looks fantastic! Thanks for liking bedmi poori recipe. Bedmi Poori and aloo sabji are a match made in heaven. Made it for one of the earlier editions of mega marathon.I can still recollect the taste ! well said PJ. we are in love with bedmi puris since the time we tasted. One of my favorite Puris and sabji. But we make it using stuffing instead of adding it into the dough. Beautiful clicks. Thanks Renu, yeah kind of kachoris. Planning to document later. After seeing so many of you having made urad dal puri, am tempted to make them as they look so crispy and with your flavorful curry, its the ultimate treat. I had benefits for choosing already done recipe by many of you as a newly started blog. Thanks for liking urad dal puri. Thanks Preeti for liking urad dal puri. Thanks Gitanjali for liking these bedmi pooris. Never had this type of poori’s, especially made with urad dal. It looks delicious. Bookmarked it. Pavani initially when I used to see bedmi pooris I was like what is this name??? but since we had in Agra, really can’t stop loving them. do try at least once. Have tasted this classic combo once in Delhi and the taste still lingers in my mouth. Now that I have a full proof recipe will try it. Thanks for the share . Thanks Poonam for liking urad dal poori. seriously they are so addictive. Never knew poori can be made with urad dal. Sounds interesting and delightful. Lovely share. Thanks Geetha, yeah when wee first tasted even I was surprised to have the bedmi pooris. Wow! this is a fabulous share. I am amazed by the alphabetic collection of bread you have on the blog. Thanks Seema for liking Indian Flatbreads collection. This looks so delicious and the bedmi poori must be flavoursome. I must make this sometime. Thanks Jayashree for liking these. hahhhahahha this is what calls a bedmi poori magic. really I love these pooris. What a bliss to have hot bedmi poor with aloo like sabzi. I have once tasted this upon my visit to Agra. yeah just outside of tajmahal we tasted these and gone crazy ever since on this bedmi poori. The puris have puffed up to perfection and what a delicious combo!! Want to grab a few puris from the plate!! Thanks Padma for liking bedmi poori recipe. I recently tried this bedmi puri recipe trust me we loved it totally 🙂 Also,your aloo curry looks so delish ! Thanks Priya for liking urad dal pooris. Heard a lot about this poori.. Looks so inviting. I must try it….. it does not even look oily. yeah they were not oily. Thanks for liking these urad dal pooris. Had these yummy pooris in Banaras the Kachori sabzi stalls sell similar kind of stuff they were delicious, your recipe sounds similar have to try this for sure, the Pics are making me drool. you know I get confused sometimes because the same kind of recipe is also happening in another state. so now started documenting with details. Poori looks so perfectly puffed, love it with aloo ki sabzi. This was one of our fav dishes we had during our Delhi meet. Looking at your puffed up pooris I am reminded of those wonderful days. Thanks Gayatri for liking urad dal poori or bedmi poori. This has been one of my favourite breakfast as a kid since it was available at every nook and corner in Old Delhi . The staff. would run and get it and it would be still piping hot . Times have changed , and now we do not eat as before , the fried pooris are reserved for special occasions , though they still remain a favourite . The whole platter is inviting and very well made . Thanks so much di for appreciating. I made first time and ate these bedmi pooris in agra visit. That is such a classic combination, Bhawana. Love the spicy puris with the aloo sabji. Great platter. Thanks Harini for liking bedmi poori. We love these. That looks so tempting. The pooris have puffed up beautifully….hard to resist such a delightful dish!! Bedmi poori and aloo sabji, whatelse a foodie need. These both dishes are prefect pair to enjoy a meal without any fuss. My kind of comforting food, though am keeping myself away from deep frying. so true, even we have them once a month. but so indulging.